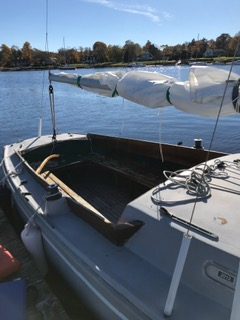 Boat Description: The boat is in poor to good shape but still sails quite well. 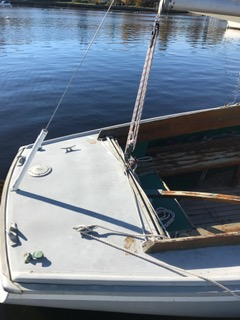 The deck has soft spots and the port gunwale has a crack from previous owners. Under the floor boards is not pretty but serviceable. 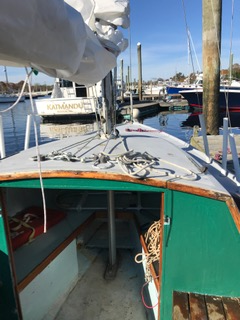 In the past two years, I updated the jib halyard, main halyard, traveler line and mainsheet, and upgraded the jib winches and halyard cam cleats. Sails Description: Two year old mainsail from Quantum – Thurston sailmakers. 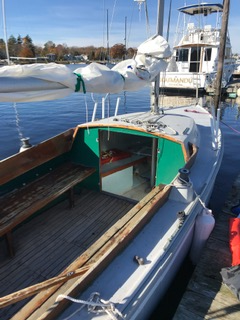 Jib, genoa, and spinnaker are from the previous owner - age unknown, probably original. Trailer Description: One year old Ensign Spars yard trailer in great condition. Boat Cover? : Yes, a worn but useable mooring cover. Travel Equipment Description: Travel straps and if you want, my homemade mast supports.